Accordingly, numerous automated guided vehicles (AGVs) will be introduced into the new warehouse logistics system and, together with sorting personnel, will be able to conduct fast, efficient cargo sorting to reduce the time between product sorting and shipping. The computers used by the customer in each sorting station were conventional wall-mount computers. The system upgrade and increase in cargo handling meant that personnel would require a system with multi-screen support; thus, the original computer configuration was no longer suitable. In addition, as is common with warehouse environments, the presence of dust is a known problem for computers because it invariably results in fan malfunctions, thus affecting heat management. Given the volume of orders received by this company, any workflow errors or interruptions due to equipment failure would be unacceptable. Another key consideration was the massive data transmission requirements for processing the enormous amount of cargo.Construction of a network environment that improved on the reliability and stability of the company’s system was a critical issue. A key point of the new system was to ensure that each sorting station could be linked together while providing continuous data transmission in order to construct the most reliable transmission backbone network to meet the needs of modern warehouse logistics. The two major system requirements were thus 1) high-performance,fanless, small-sized desktop industrial computers and 2) a stable and reliable wired/wireless network. 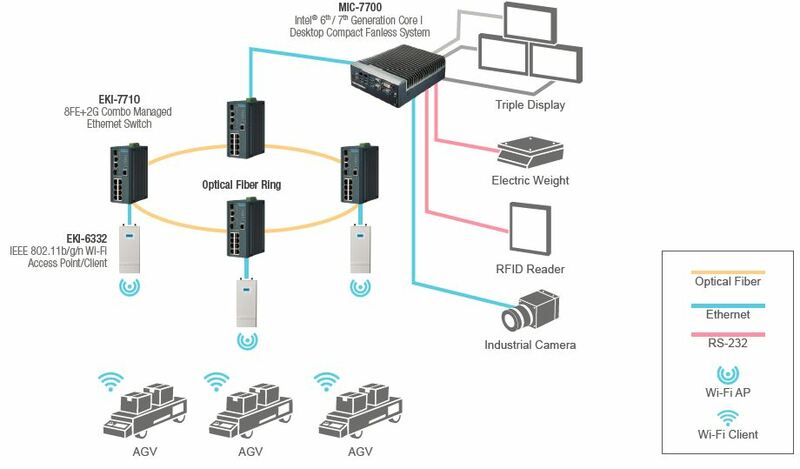 Advantech recommended the MIC-7700 as the core for the overall warehouse logistics system. This fanless system was to be used at each sorting station, providing a high-performance CPU that would more than satisfy the company’s computing requirement while eliminating problems caused by dust. The MIC-7700 is a low-cost option that supports desktop processors while ensuring high performance. Its compact structure and single-side I/O design facilitates quick installation and subsequent maintenance. Advantech’s own MIC-Door iDoor design reserves I/O space with a scalable i-Module design for at least 20 PCIe buses (1~4 slots), 9~36 V power voltage, and functions environments where temperatures are in the range of -10~50°C. For the network architecture, we recommended utilizing the EKI-7710 industrial-grade managed Ethernet switch as the overall backbone network. Given the sheer amount of equipment in the whole warehouse (e.g., metal cargo shelves, logistic transport belts, and automated cranes), standard business switches—although low-cost—would be unable provide a reliable and stable network environment. Furthermore,with the large volumes of data requiring upload, any interruptions could potentially result in major problems for the entire sorting process. As an effective countermeasure, a fiber optic loop network with the EKI-7710 was adopted to eliminate this possibility. Because the warehouse logistics system utilized many AGVs that are controlled wirelessly, establishing reliable wireless environment coverage was critical in order facilitate their operation. For this, the EKI-6332 industrial-grade 2.4G wireless access point was adopted for wireless coverage of the whole site. This unit provides a high level of interference resistance and, through its connection with the EKI-7710, extended the entire network environment from a wired configuration to a wireless one. With this system, all AGV control orders are given from each MIC-7700, passed through the EKI-7710, and then wirelessly transmitted to the AGV via the EKI-6332. The AGV accordingly moves the cargo shelves to the target sorting station as instructed. Hence, the implementation of Advantech’s solution provided a complete, stable, and reliable network architecture. Advantech’s comprehensive solution was a successful upgrade for the customer’s warehouse logistics system, effectively improving the efficiency of cargo sorting, shortening the time from product collection to sorting and then shipment, and minimizing shipment errors, thus ensuring improved customer satisfaction.